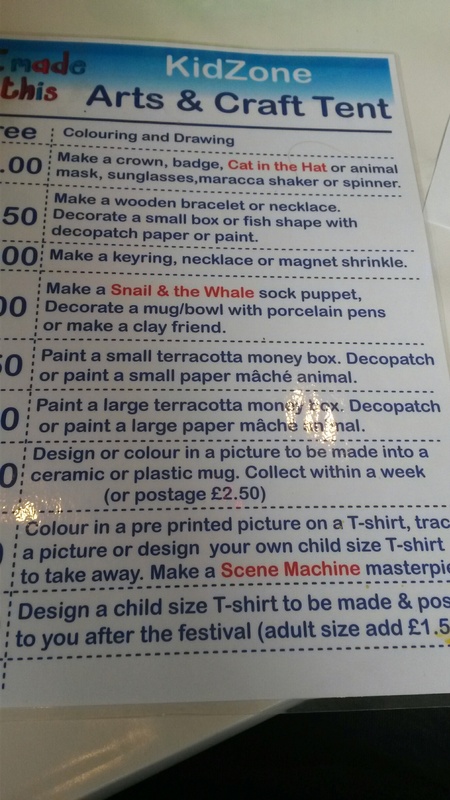 Folks…in a follow up to my feature on the rather fantastic Kidzone at the Pleasance this year, here is the list of brilliant arts and crafts activities they will be offering with the prices – as always its very reasonable and I’ve heard the arts and crafts area is even bigger this year ! 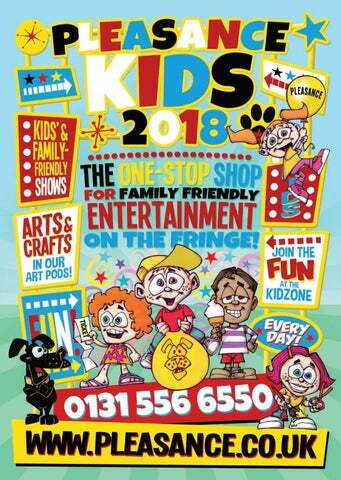 So definitely well worth a visit and making a day of when you go see one of the fabulous kids shows at the Pleasance this year too ! I love the Kidzone at the Pleasance…with it’s puppet shows, toys, picnic tables, free colouring, the fantastic and very reasonable arts and crafts activities and of course, the fabulous Green cafe, keeping all us awake and enthused with hot drinks !! It makes for a perfect day out if you combine it with checking out a show or two from the fantastic 16 children’s shows on offer at the Pleasance this year ! The Giant Jam Sandwich – I love reading this book with my kids and am very curious into how they’ll be adapting it for the stage !! Expect rhymes and silliness galore! The Gruffalo’s Child – Tall Stories make great theatre for kids, and sticking to much loved Julia Donadlson books seems to be working out for them very well !! Expect the usual beautiful puppets, inventive sets and musical melodies ! Mavis Sparkle – With a magician for a Dad and a stargazer for a Mum, no wonder there’s more to Mavis than meets the eye! This looks rather magical and adventurous ! The Listies Make You LOL – Returning from their successful run last year, the Listies are hilarious, messy and decidedly insane. Featuring alien attacks, toilet paper guns and the most disgusting pair of underpants you have ever seen in your life ! The Polar Bears Go up – The Polar Bears are moving up in the world. They’ve lost their balloon and they need to get it back. It’s time to get up, step up, climb up, jump up. One thing’s for sure, the only way is up! These lovable Polar Bears are intrepid explorers, famous for their wild expeditions. So, after reading all the programmes, watching the venues being built and seeing hundreds of posters appear all over the city, yesterday I managed to head to the festival and see some shows !! We had a great day, I’ll be posting some reviews soon, so please keep checking back to that page. Firstly we saw Captain Flinn and The Pirate Dinosaurs 2: The Magic Cutlass, which was fun and energetic and a great show for wee ones, it has a little bit of everything: catchy songs, dinosaurs, puppets and a few surprises ! Then we headed along to check out the kidzone at the Pleasance, which was as great as always. 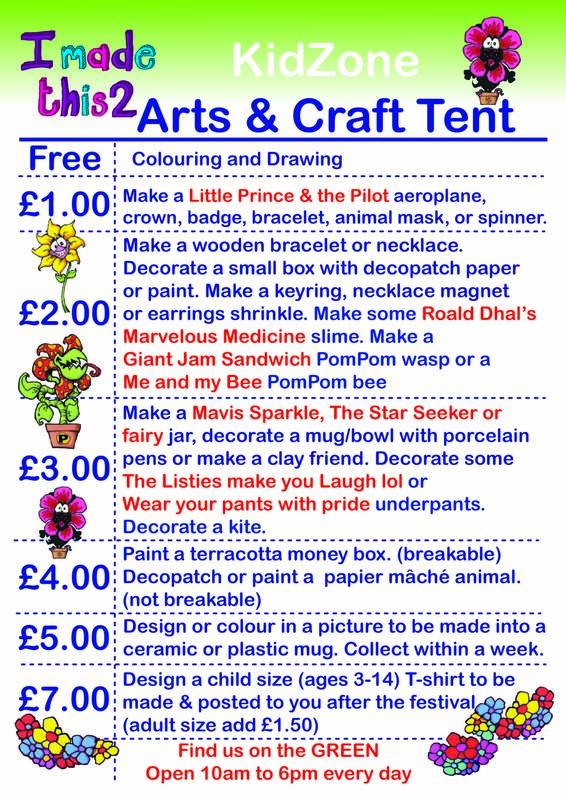 We did some of the arts and crafts – you can see what’s on offer in the photo, and prices start at £1 which I think is fantastic value in the festival – it was busy and lots of little ones were enjoying being creative there ! 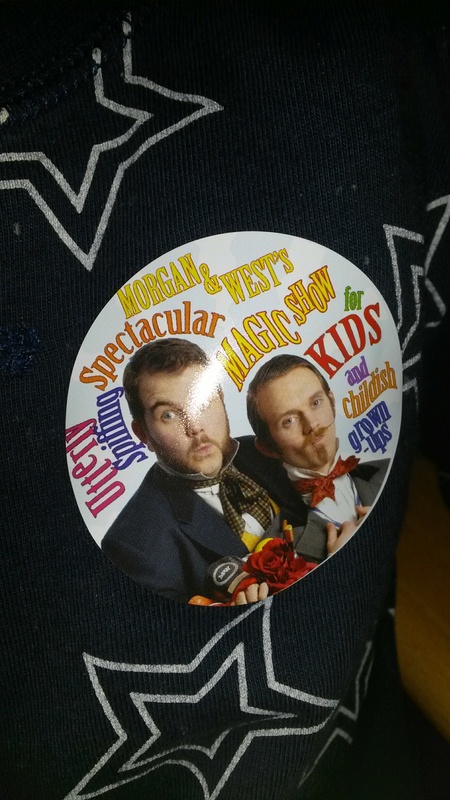 To finish off our first day we headed along to see Morgan & West’s Utterly Spiffing Spectacular Magic Show for Kids (and Childish Grown-Ups!) – which was brilliant – they are such a fantastic and quick witted duo and know exactly how to pitch things for kids. There was plenty of audience participation and lots of magic to keep everyone guessing – it’s well worth checking out and was very busy today, so get your tickets early !